This San Diego Comic-Con, Titan Comics brings its biggest ever offering of exciting debuts, limited editions, SDCC variants and appearances from a host of creators including Jody Houser (Thirteenth Doctor), Max Allan Collins (Mickey Spillane’s Mike Hammer), V.E. Schwab (Shades of Magic: The Steel Prince), and Bill Morrison (The Beatles’ Yellow Submarine)! Beatles fans can celebrate the 50th Anniversary of The Beatles’ Yellow Submarine at SDCC as Titan debuts its hotly-anticipated official graphic novel adaptation ahead of the August 28 release. Writer/artist Bill Morrison, inker Andrew Pepoy, and colorist Nathan Kane give fans an exclusive behind-the-scenes look of the making of the graphic novel in a special Yellow Submarine panel on Sunday, July 22 at 10am. Plus, fans can get the debut edition signed by the creators at the Titan booth #5537 on Thursday, July 19 at 11am and Sunday, July 22 at 11:30am. Saturday, July 21 at SDCC is a Doctor Who-themed day for Titan with many signings and a huge panel that Whovians will not want to miss! The Thirteenth Doctor comic writer Jody Houser takes fans on a journey down the road to the Thirteenth Doctor in an unmissable Doctor Who comics panel on Saturday, July 21 at 5:30pm. Jody will be joined by a host of Doctor Who creators, including Richard Dinnick, who’ll be discussing the upcoming release of The Thirteenth Doctor Volume 0: The Many Lives of Doctor Who, which sees The Thirteenth Doctor relive unseen adventures from all her past selves. Fans will get the chance to meet Jody Houser, who’ll be signing copies of Doctor Who: Road To The Thirteenth Doctor – Tenth Doctor #1, which features a Thirteenth Doctor lead-in story written by Jody, and comes with an exclusive SDCC cover by fan-favorite cover artist Kelly Yates – who will be also signing at the Titan booth, #5537. Titan Comics presents a first look at V.E. Schwab’s Shades of Magic: The Steel Prince prequel comic book series – set in the world of the New York Times bestselling fantasy novel series – with an ashcan debuting exclusively at SDCC – only available at Titan booth #5537! V.E. Schwab will also discuss the origins of this hotly-anticipated new prequel comic at a panel on Friday, July 20 at 12pm. Plus, she will be signing copies of the SDCC ashcan straight after the panel at Titan booth #5537, and again on Sunday, July 22. As part of Titan’s Mickey Spillane centenary celebrations in 2018, join Max Allan Collins (Quarry’s War, Road To Perdition) as he discusses the life and legacy of Mickey Spillane in a special Hard Case Crime panel on Thursday, July 19 at 12:30pm. Plus, straight after the panel, Max will also be signing copies of his new comic Mickey Spillane’s Mike Hammer – based on an original plot by Mickey Spillane – which comes with an exclusive SDCC virgin variant cover by James Bond artist Robert McGinnis. The excitement doesn’t end there as Titan have their first ever panel highlighting the hit Statix Press line of comics on Thursday, July 19 at 2:30pm, which will include the announcement of a major new film project. Created to showcase some of the greatest talents from Europe and around the globe, Statix are pleased to welcome Alisik co-creator and artist, Helge Vogt, who is flying in from Germany for his very first U.S. convention appearance. Helge will be appearing on the panel, then signing afterwards from 4pm at the Titan booth #5537. Celebrating the 50th anniversary of The Beatles’ Yellow Submarine, join writer/artist Bill Morrison, inker Andrew Pepoy and colorist Nathan Kane as they sign copies of The Beatles’ Yellow Submarine graphic novel adaptation, which exclusively debuts at SDCC ahead of its August 28 release. In this special anniversary discussion, Titan Publishing’s Andrew Sumner sits down with writer Max Allan Collins (Quarry’s War, Road To Perdition) to discuss the life and legacy of Mickey Spillane in what would have been his centenary year. They delve into the history of his most famous creation, Mike Hammer, along with his return to comics in an all-new Titan series based on one of Mickey’s original plots. Join writer Cavan Scott as he signs copies of Doctor Who Lost Dimension Vol 1 & 2, Doctor Who: The Supremacy of The Cybermen and Doctor Who: The Twelfth Doctor Year One, Vikings and TEKKEN. Join Max Allan Collins as he signs copies of Mickey Spillane’s Mike Hammer #1 comic, which comes with an exclusive SDCC cover by famed artist Robert McGinnis (James Bond, Breakfast at Tiffany’s)! Max will also be signing copies of his recent graphic novel Quarry’s War, and new novels – The Last Stand and Killing Town. Comics have such a rich history across the globe, yet so few are being translated into English for U.S. audiences to enjoy. Titan Comics is changing that with their bold new imprint, Statix Press, which debuted last year. Join Publishers Weekly’s Heidi Macdonald along with writer/artist Helge Vogt (Alisik), brand manager Chris Thompson (Statix Press), and buyer Terence Irvins (Kinokuniya Books) to discuss the international comics scene and what the industry is like across Europe (and around the world). Join writer/artist Helge Vogt as he signs copies of his critically acclaimed graphic novel, Alisik. Join Harmony Gold’s Tommy Yune as he signs copies of Robotech comics and graphic novels. V.E. Schwab’s best-selling novel series, Shades of Magic, makes the jump to comics this year with an all-new comic series written by Victoria herself. In this special spotlight panel, Victoria will discuss the origins of this critically-acclaimed world and how comics enable her to tell new stories that have never been seen before. Join writer Jody Houser and cover artist Kelly Yates as they sign copies of Doctor Who: Road To The Thirteenth Doctor – Tenth Doctor #1, which comes with an exclusive SDCC cover. Join writer George Mann as he signs copies of Doctor Who Lost Dimension Vol 1 & 2, Doctor Who: The Supremacy Of The Cybermen and Doctor Who: The Twelfth Doctor Year One. Join writers Richard Dinnick and Paul Cornell as they sign copies of Doctor Who Four Doctors, Doctor Who Third Doctor and Doctor Who Twelfth Doctor Time Trials – A Confusion Of Angels. With the upcoming debut of the first female Doctor and the impending launch of her own comic series, Titan Comics’ Doctor Who creators discuss the past, present and future of this amazing franchise. 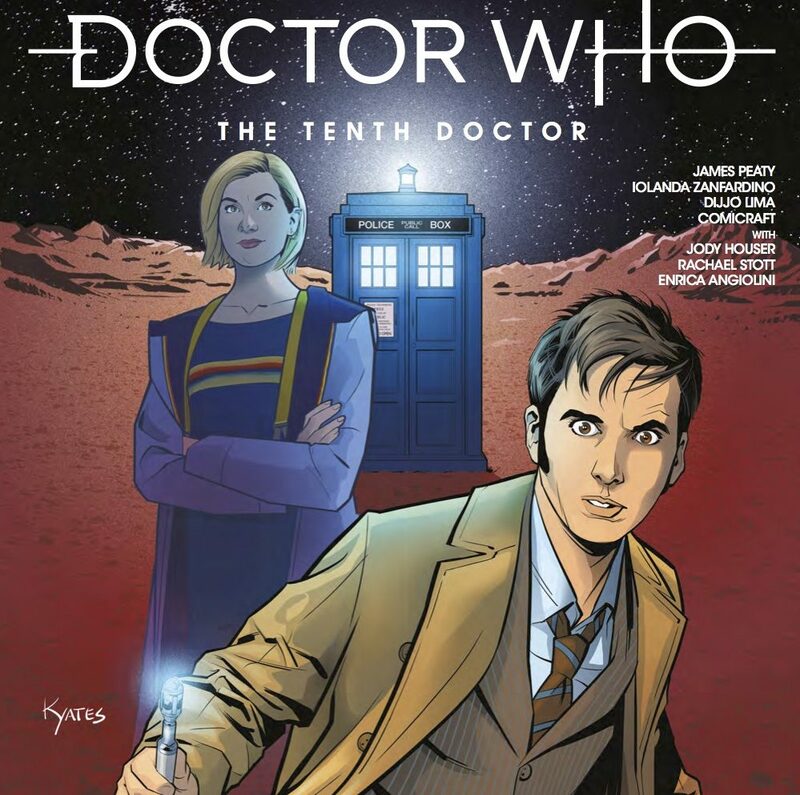 Join Titan Comics brand manager Chris Thompson as he chats with Thirteenth Doctor writer Jody Houser, along with creators Richard Dinnick, Cavan Scott, George Mann, Paul Cornell and Kelly Yates, on a journey through space and time. To celebrate the 50th Anniversary of The Beatles’ Yellow Submarine, Titan Comics are proud to release the official graphic novel adaptation, which debuts at SDCC 2018. See the Blue Meanies come to vivid life as The Hollywood Reporter’s Graeme McMillan chats with writer/artist Bill Morrison (The Simpsons) about the years he’s spent working on this deeply personal project. PREVIOUS POST Previous post: Comedy Central Gets Silly with South Park Activations at SDCC!